Membership Requirements Includes information on joining CAPT/ACAP as a new or annually renewing member, as well as membership information such as the association’s member fees, bylaws, member pledge, and use of the CAPT/ACAP logo by members. Unisonus … (What’s in a name) … The first part of the word “unisonus” is based on the musical term of singing in “unison”. For piano tuners and technicians this word has another connotation. During piano service it is necessary to precisely match the tuning of the two or three strings of a single note so their “tones” or sounds match without dissonance … or “beats” as piano tuners identify tones that do not match. If the strings of a single note are adjusted in tension (put in “tune”) so they sound as a single tone they have become in “unison”. Adding the word “us” at the end of unison makes the combined words a fit description for an association of piano tuners with a similar task. 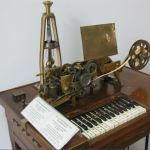 The above Printing Telegraph with its piano-like keyboard was a communication device c.1900. More about this image and credits. CAPT/ACAP Logo … Organizations that wish to use the logo in providing a link to the CAPT/ACAP website may contact the Administration to obtain permissions. Read More on this logo and its use by members of CAPT/ACAP. Can’t log-in / Lost password? – See Connect page.